Chemical signs ought to be letters, for the greater facility of writing, and not to disfigure a printed book ... 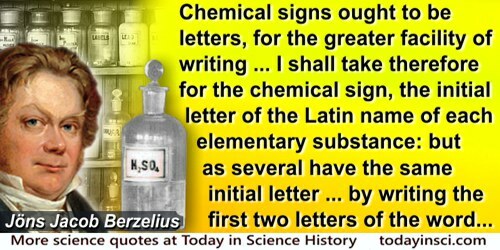 I shall take therefore for the chemical sign, the initial letter of the Latin name of each elementary substance: but as several have the same initial letter, I shall distinguish them in the following manner:— 1. In the class which I shall call metalloids, I shall employ the initial letter only, even when this letter is common to the metalloid and to some metal. 2. In the class of metals, I shall distinguish those that have the same initials with another metal, or a metalloid, by writing the first two letters of the word. 3. If the first two letters be common to two metals, I shall, in that case, add to the initial letter the first consonant which they have not in common: for example, S = sulphur, Si = silicium, St = stibium (antimony), Sn = stannum (tin), C = carbonicum, Co = colbaltum (colbalt), Cu = cuprum (copper), O = oxygen, Os = osmium, &c.
'Essay on the Cause of Chemical Proportions, and on some circumstances relating to them: together with a short and easy method of expressing them', Annals of Philosophy, 1814, 3,51-2.